There was a moment of silence for Lyle Helland at Friday night’s Warrior’s game. Riley Sutter, Sahvan Khaira and the Everett Silvertips graced the ice at Mosaic Place on Friday night for a showdown with your Moose Jaw Warriors. In tow was red hot goaltender Dustin Wolf, who has been pretty difficult to beat all season long. 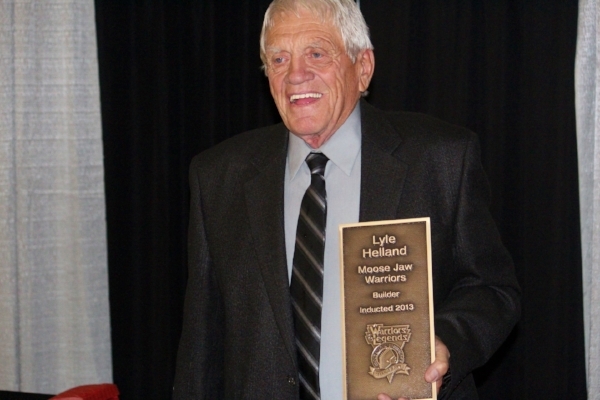 Lyle Helland was inducted into the Warriors Hall of Fame in 2013. For the Warriors it was a chance to get back in the win column after a tight loss to the league leading Prince Albert Raiders. The evening was marked with a moment of silence for Lyle Helland, a Warriors Hall of Fame member for the work he did in bringing the Warriors to Moose Jaw from Winnipeg. Helland passed away earlier this week. Moose Jaw managed to get on the board first, cracking the Dustin Wolf code at 15:33 of the first period, when Tristan Langan potted his 10th of the season, with assistance from Keenan Taphorn and Justin Almeida. But as soon as the code was cracked, Wolf adapted, and resumed with being nearly impenetrable again. The remainder of the period was a back-and-forth affair, with neither team coming across as stronger than the other. In the 16th minute of period two Sahvan Khaira leveled things out. The goal was the defender's third of the season and it was assisted by Gianni Fairbrother. The score would remain that way for the remainder of the second and then the third as well. It took an extra period to get a winner, and almost immediately into the overtime period the Silvertips got what they were looking for as Bryce Kindopp set up Wyatt Wylie for his third of the season. The Warriors will aboard the bus first thing in the morning and head to Medicine Hat for a showdown with the Tigers.